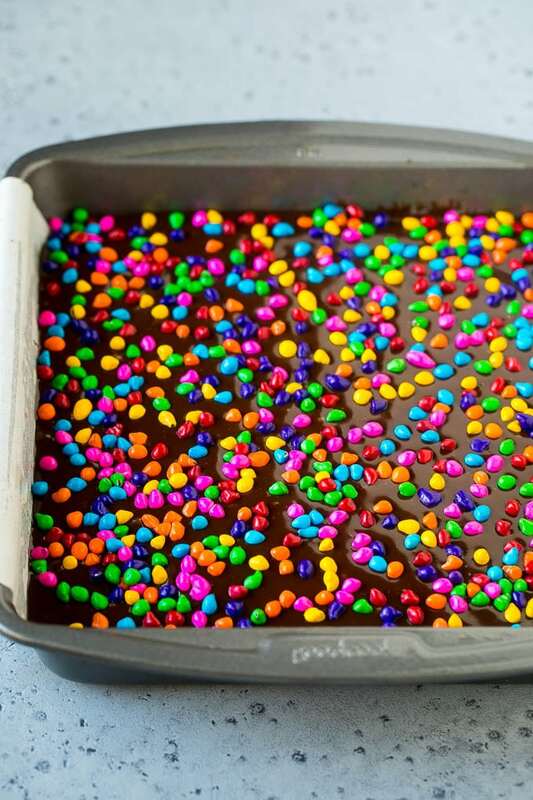 When I’m looking for a fun treat for the kids, I make cake balls, fruit pizza or these bright and colorful Cosmic Brownies. But let’s be real – the adults love these brownies just as much as the kids do. 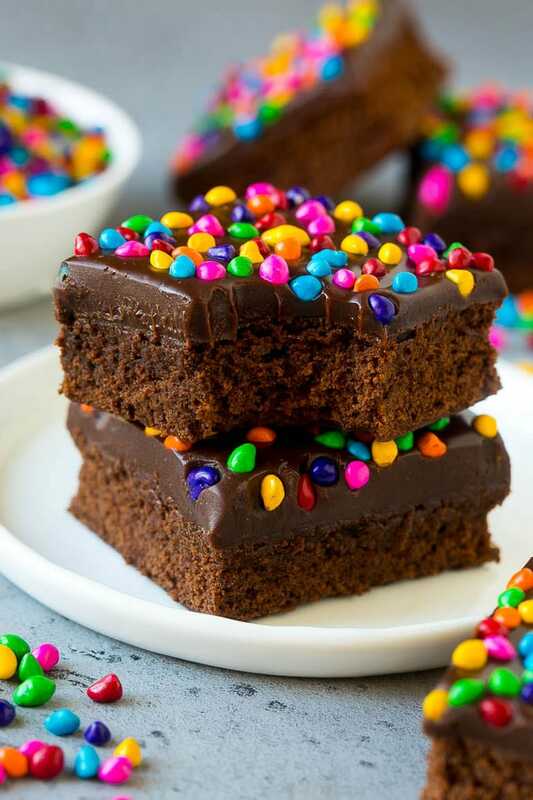 I grew up eating Cosmic Brownies from the Little Debbie box, and I wanted to share those awesome little fudgy bites with my kids. I decided to skip the grocery store and instead make a homemade version of these brownies which is SO much more flavorful than the original. 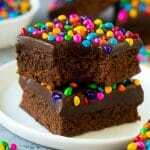 What are cosmic brownies made of? 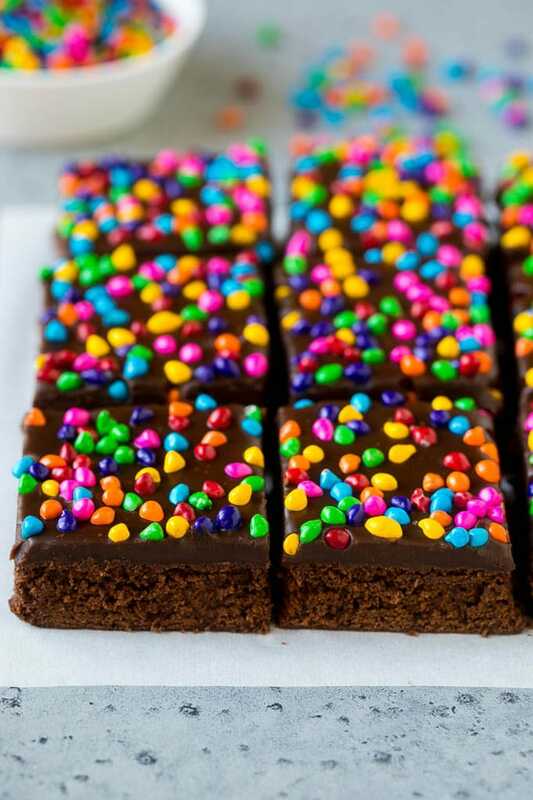 Cosmic Brownies are a fudgy chocolate brownie topped with a thick chocolate frosting and rainbow candy coated sprinkles. They were made famous by the Little Debbie Company. How do you make cosmic brownies? This recipe starts with a homemade brownie base which is flavored with butter, sugar and cocoa powder. The brownies go into the oven to bake, and then are topped with a rich chocolate ganache frosting. The finishing touch is a generous sprinkling of rainbow candy coated chocolate pieces. After the brownies have cooled, it’s time to cut them into squares and enjoy! The candy coated chocolate pieces can be purchased online, at grocery stores, or at craft stores. I used Wilton’s Rainbow Chip Crunch which I purchased in the cake decorating aisle of my local craft store. Can’t find the rainbow chips? You can use regular miniature chocolate chips or a different type of rainbow sprinkles instead. It’s best to use chopped bars of chocolate instead of chocolate chips for the fudge topping. Chocolate chips often contain stabilizers and will not melt as smoothly as chopped chocolate. I used Ghirardelli brand chocolate bars which I found in the baking area near the chocolate chips. These brownies are best stored in the fridge. If you make the brownies on a hot day and leave them at room temperature, the frosting can get quite soft. These brownies can be stored in an airtight container in the refrigerator for up to 5 days. I find that they never last that long though! Let the brownies sit at room temperature for about 10-15 minutes before you serve them to take the chill off. Cosmic Brownies are a great candidate for the freezer. Simply wrap the bars individually with plastic wrap, then place them in a resealable bag in the freezer for up to 2 months. You can thaw your brownies at room temperature when you’re ready to eat them. 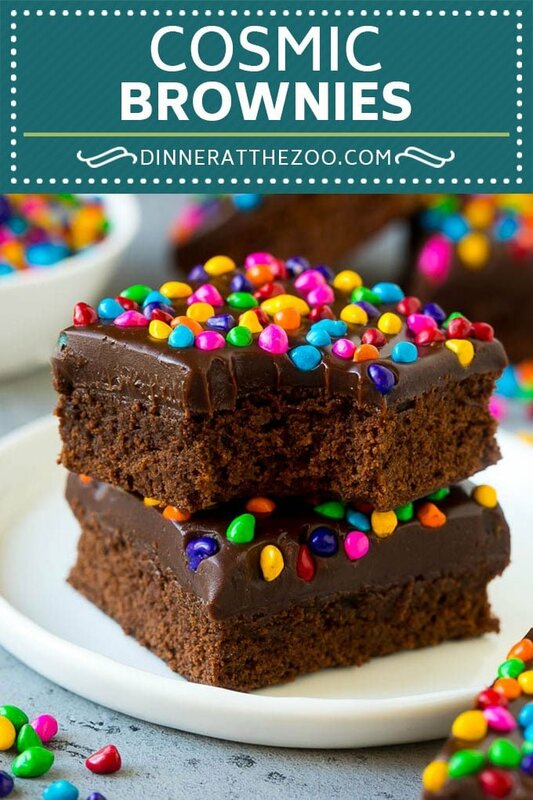 Cosmic Brownies are definitely not just for the kids – they’re a great addition to any dessert table and are sure to earn you rave reviews. Preheat the oven to 350 degrees F. Line a 9" x 9" square pan with a piece of parchment paper, leaving an overhang on both sides. Coat the pan with cooking spray. Place the butter in a large microwave safe bowl. Microwave in 30 second increments until melted. Add the sugar to the melted butter and whisk to combine. 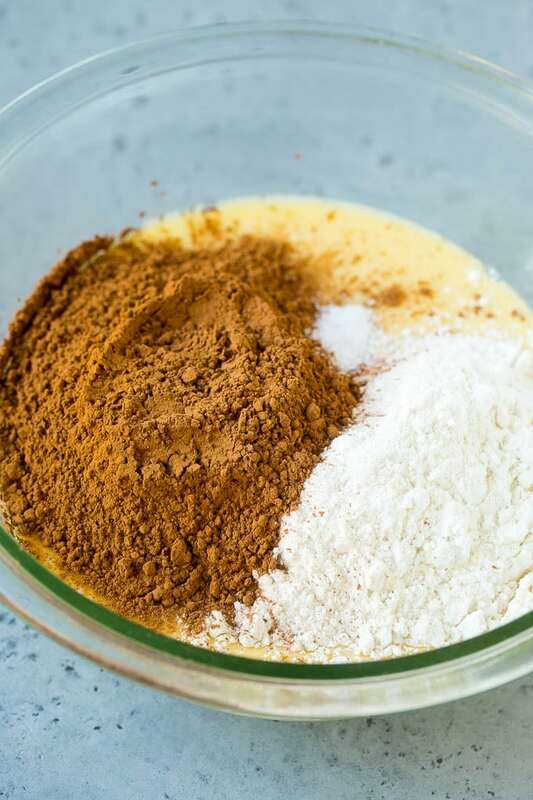 Place the sugar and butter mixture in the bowl of a mixer. Beat on medium speed for 2-3 minutes. Add the eggs and vanilla to the bowl; then beat for another 2-3 minutes until mixture is pale yellow and thick. Add the flour, cocoa powder and salt. Mix on low speed until ingredients are just incorporated. Stir in the milk and mix until smooth. Pour the batter into the prepared pan, and spread it into an even layer. Bake for 20-25 minutes until a toothpick inserted into the center of the pan comes out clean or with just a few crumbs attached to it. Place the heavy cream in a medium bowl. Microwave in 20 second increments until cream is very hot but not boiling. Add the chopped chocolates to the cream. 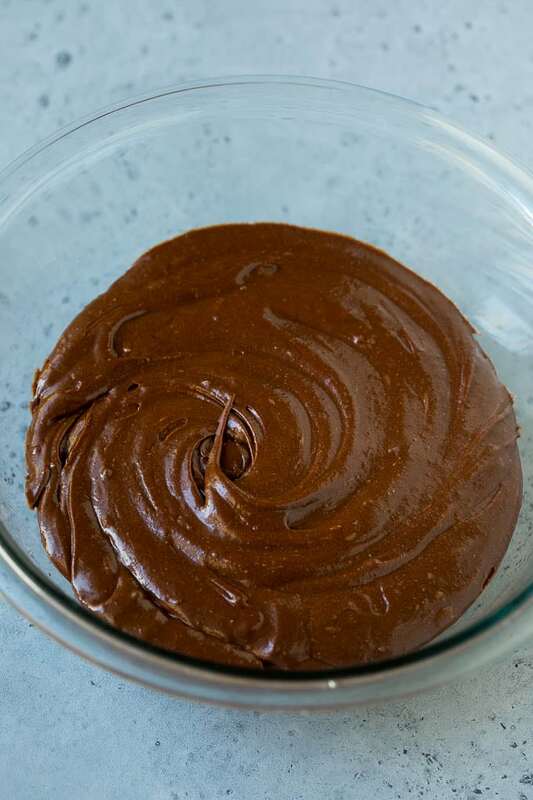 Let sit for a minute, then stir until a smooth chocolate mixture forms. Stir in the butter until melted. Pour the chocolate over the top of the brownies. Use a spatula to spread the chocolate into an even layer. Add the sprinkles on top of the chocolate. Chill the brownies until set, about 1-2 hours. Use the parchment to lift the brownies out of the pan. Cut into squares and serve. Adapted from Love & Olive Oil. These are so pretty! This would be perfect for my daughter’s Easter party at school! They look mouthwatering! 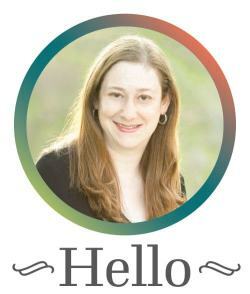 Thank you for sharing in the holidays! Such a nostalgic treat! Love the idea of making these at home! These look yummy!! What size pan though? It’s a 9 inch square pan, sorry about the omission! These look so fun! I’m going to make these for my daughter’s class party next week, thanks! One of my favorites back in the day! Definitely excited to make this!